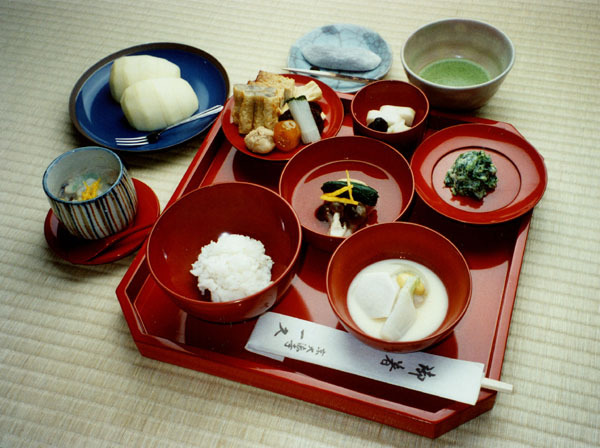 In my blog I will often refer to “shojin-ryori” (pronounced “show-jin-ree-or-ee”), which loosely means “Japanese vegetarian cuisine” and I usually suggest “Zen cuisine” as a translation but actually its not that easy to translate into English. Google Translate says, “vegetarian meal”, whilst my dictionary goes a bit further saying “vegetarian cuisine originally derived from the dietary restrictions of Buddhist monks”. Mmmm, that doesn’t make it sound very tasty! But I hope you’ll see from my blog that shojin ryori is truly delicious for the body and the soul. Well, the second part “ryori” has a straightforward meaning of cooking or cuisine, and is a very common word in Japanese – such as, “I like cooking” or “Let’s have Italian food”. However, the first word “shojin” has meanings that on the surface appear to have nothing to do with cooking. This is a specific Buddhist term that means “effort; diligence; enthusiasm; zeal; pure or unadulterated spiritual progress; the strenuous and sustained effort that is required to overcome laziness or lack of meditative concentration; courageously progressing with the good and eliminating the evil; persistent effort for the well-being of others; developing strength of character.” In fact, this is one of the foundational elements of Buddhism that is found in the Noble Eightfold Path, which was the Buddha’s prescription for living a fulfilling life. Now imagine if we could bring that kind of enthusiastic effort to bear in the process of cooking! We’d certainly cook up storm! However, it kind of brings to mind a manic contestant from My Kitchen Rules and I don’t think that applies to most of us when we’re standing at the fridge peering in and trying to be creative with what’s left in the veggie crisper! But rather than emphasising manic zeal, “effort” in this case means that we practice bringing a concentrated awareness to the whole process of cooking. For example, when we go shopping, effort means being aware of what season it is and buying food that is appropriate to the season because in winter, for instance, our bodies need sustenance that warms us like root vegetables and we need protection from colds by eating food full of vitamin C like oranges. And whaddaya know! Root vegetables and oranges are seasonal to winter, giving us just what we need. But with all the foods that we can buy that are out of season these days, it is quite difficult to learn to hear what our bodies need to best sustain us through the season. This is one way that we can bring awareness into shopping for food; this is the meaning of shojin = effort. Likewise, this effort of practicing awareness can be brought into our preparation of the food, in the way that we serve it and even in the way we clear up. Spend some time just carefully looking at the marvellous colour of a carrot as you cut it up, recognise that is has been in the ground slowly growing by drawing in all the goodness of the earth, that someone’s hand pulled it out of the ground, that it has had a long journey encountering many people, all who have their own life stories to tell, and in this way, that one carrot becomes a source of beauty and connection to the earth and many other living beings. If we can practice being attentive to just the task at hand, rather than letting our minds wander all over the place, this is the practice of awareness, this is the effort of shojin. There are a lot of other considerations in shojin ryori as a spiritual practice, which I hope to explore in this blog. I like to think of this practice as “Kitchen Sink Zen”! Try it! This entry was posted in Buddhism, Cooking, Spirituality, Vegan, Vegetarian and tagged cooking, eightfold path, food, right effort, seasons, shojin ryori. Bookmark the permalink.